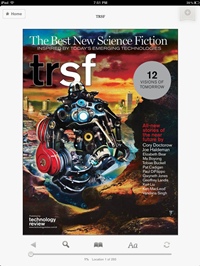 Technology Review, MIT's science magazine for consumers, is branching out into science fiction with a new annual publication called TRSF. The new 80-page pub, available in paper and electronic form for $7.95, contains 12 stories of the near future from such authors as Cory Doctorow, Joe Haldeman and Pat Cadigan. Technology Review has published science fiction within its pages in the past, but the integration wasn't quite right, explained Stephen Cass, editor of TRSF and Technology Review's special projects editor. "When we put them in the feature well with all these straight journalism stories, they didn't fit very well," he told PCWorld. The story lineup in the current issue is linked to topics covered by Technology Review, Cass says, such as computing, materials, energy, the Web, biomedicine, communication and space flight. "The whole point of TRSF is that science fiction artists can go a little bit beyond where we can go as journalists in thinking about the future." "[The magazine] is always going to be grounded in just past bleeding edge," he adds. "Whatever is going on in emerging technology, those are where the stories are going to come from." For example, in "The Brave Little Toaster," Doctorow explores the complications of disposing of a juice box when everything is "smart" and connected. Stories for TRSF are commissioned by the magazine. After researching the science fiction landscape, Cass explains that he sought contributions from authors who had shown a facility for writing in the past about near future technologies. 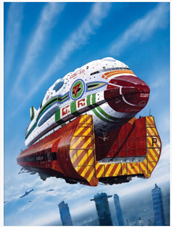 Illustration by Chris Foss, who also did the first cover art. In addition, the magazine tried to work gender and geographic diversity into its author mix, so there's a story by New Delhi born Vandana Singh, one by Beijing-based Ma Boyong, and another by UK novelist Gwyneth Jones. The magazine approached each author with a general topic area and description of some cutting edge developments in the field. "Once they accept the commission, it's up to them to pick what exactly they're going to write about," Cass notes. Pictures, as well as words, are an integral part of the new magazine. The cover was painted by notable science fiction artist Chris Foss, and six of his illustrations for works by Isaac Asimov, Gordon R. Dickson, Poul Anderson, and others are sprinkled throughout TRSF. One of the criterion for a TRSF story is that it be "hard" science fiction, which can be a slippery term in SF circles. "We want to create a bridge between the classic clanking hard science fiction of yesteryear and a more contemporary science fiction," Cass says. "For me, hard science fiction is fiction which is plausible. It's where the technology matters, where it's not a MacGuffin." "If you watch Battlestar Galactica, the technology matters, the limitations of the technology matters, so I'd think of that show as a hard science fiction series," he added. "In Star Wars, the details never matter very much. The technology provides a nice backdrop for adventure to happen." The initial success of the current issue of TRSF has spurred Technology Review to greenlight a second issue of the magazine slated for September of this year.